The TIME 100: Has Serena's online following hit its peak? After her surprising third-round exit from Wimbledon 2014, the oldest top-seeded player in WTA history is facing an intensifying debate over the state of her career. Serena Williams is no stranger to these debates, having been at the forefront of women’s tennis for over a decade. Whatever you think of her recent performance lull, it’s hard to argue with her power to get people talking. So how does she do it and will it help her career after tennis? Serena’s dominance on the court has helped her establish a fearsome reputation, and her off-court activities have strengthened her image. All this comes together in her online presence, which is tied together in her socially-focused website. The website shows visitors the moments between the matches via blogs, photos and videos. These moments dominate the site, and it’s easy to overlook Serena’s world-class status in favour of her big personality (and a pretty cute dog). A dedicated microsite, Serena Fridays, is where most of the action happens. The site has a simple layout organised by hashtags, each displaying a video and encouraging interaction on Twitter. Her video series #inmyshoes shows us mortals what the world looks like through the eyes of a tennis superstar, and a prominent 'Ask Me' button grants us a virtual audience with her. But what’s the point of all this? So far this year Serena has made $1.9m in prize money alone, making even her 4.2m Twitter followers seem insignificant. This is where the debate about physical performance rears its ugly head again. If Serena’s playing career is finally on its downward slope, then this online following could be a valuable way of keeping up her profile. The importance of non-tennis activities like charity work with the Serena Williams Foundation and fashion design with Nike is expressed in her website bio, which ends, “Serena continues to also pursue her other interests and has set herself up for a career after tennis”. What her “career after tennis” looks like is yet to be seen, but efforts to establish Serena as a personality as well as a player won’t hurt her prospects. And while her 4m-strong Twitter following may not make her serve stronger, it’s a valuable asset for a public figure. With one of the largest online followings in tennis, Serena has cemented an enduring presence in a competitive field. This ability to stick around is an important skill to have in a profession with limited longevity. Neither Serena’s career nor the social media she’s taken to so easily are mature enough to signal where they’re heading, or whether Serena can maintain a following off the tennis court. But one thing is for sure – if her online fanbase proves just as fleeting as her physical peak, she’s still an all-time tennis great who got us all talking. 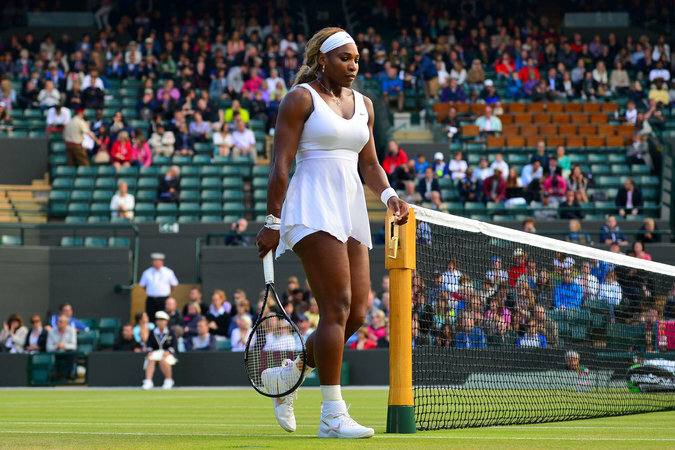 Images via New York Times and Serena Williams.